When Avalon started buying fabric bows last month, I chimed in with my mantra (insert eyeroll...here), "Why buy it, when we can make it ourselves?" Yes, it's more fun than a barrel of glitter living with me. Still, I persevered and Avalon agreed to humor me. We grabbed some lovely fabric and proceeded to whip up a bevy of beautiful bows that could be used for all sorts of fun DIY projects. Hair bows? Check. Shoe bows? Check. Bow ties? Uh, check. These are so easy to make and so adorable, you'll find it very addicting. 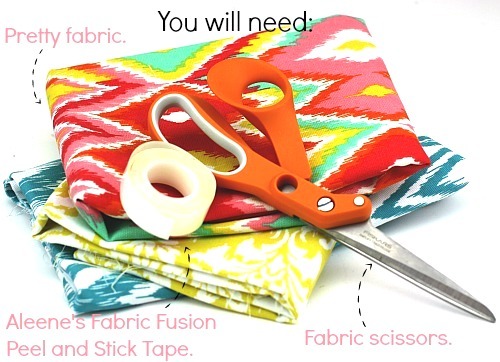 Plus, Aleene's Fabric Fusion Peel and Stick Tape means no waiting for glue to dry or burning your fingers on hot glue! What's not to love? Step One: Measure and cut fabric strips. Determine your desired width. The fabric length is folded to the center with a small overlap. The fabric width is tucked under a little bit on one side and folded to the center. You'll need to measure and cut the fabric a little more than twice as wide and long as your finished width and length. I like to make the smaller segment longer than needed, this gives me some tension when wrapping and securing it around the larger bow portion. (To make a 4" bow the larger fabric should be 81/2" long and 41/4" wide.) Step Two: Fold one long side of the fabric to the center point. Cut a small section of Aleene's Fabric Fusion tape and place it on the center of the fabric. Use your scissors end to burnish the tape so it sticks, and peel the top off to reveal the sticky part. Fold the other end over, tucking it about 1/4" so the raw edge is not exposed. Press firmly to secure. Step Three: Repeat for the smaller fabric section. Step Four: Tuck one long end of the larger fabric section into the opposite side. This keeps the ends from popping out and exposing the raw edges. Step Five: Place a small piece of tape on one end of your smaller fabric piece. Step Six: Wrap the small piece around the center of the larger piece. Try to squeeze the back portion smaller letting the front portion overlap a little as in picture. 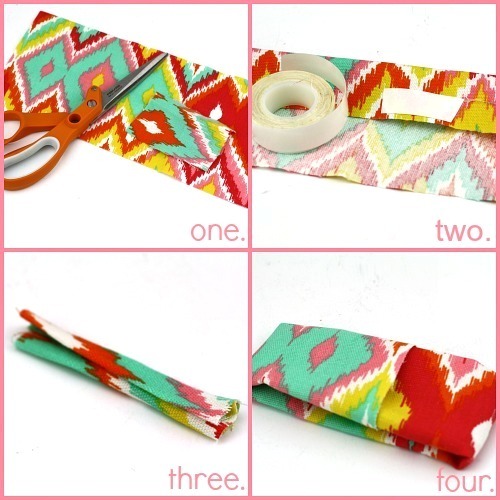 Cut off any excess fabric on the smaller section. Use the scissors handle to firmly press down and ensure the fabric is secure. Step Seven: You can attach your bow to a larger barrette, thread it with a bobby pin, turn it into a bow tie, glue it to a shoe clip, attach it to a purse...in fact you can put your bow wherever you please! I slid a bobby pin into the back of the bow and it works perfectly as a hair bow accent for a pony tail or bun. Step eight: Before you wear your bow, adjust the front portion by gently pulling on both sides at the top of your bow. That's it! 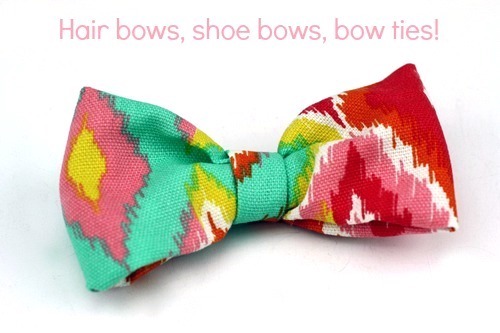 So simple it's silly, why would you ever buy a bow when you can make them! 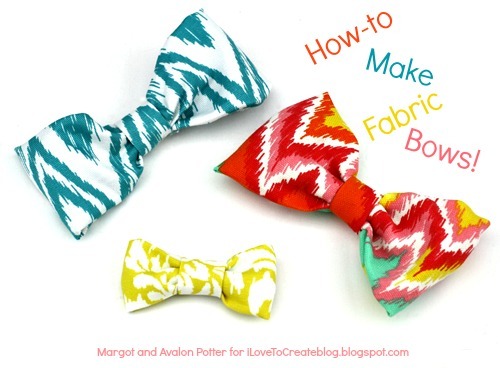 Make a bunch of bows! Have a bow making party! Make giant bows, tiny bows, medium sized bows! Try making them from burlap, silk, denim, ribbon, lace! What would you do with your bows, do tell? We'd love to know. You can find more DIY and Fashion at DIY Doyenne. Join the crafty conversation at the iLoveToCreate Facebook page! Nice little detail tips on this. Thank you Margot and Avalon. I recently attended a wedding where a 2-month old had a lime green polka dot bow tie just like this clipped onto his white onesie. It was so cute! I wondered where they bought such a clever little thing - duh. I bet the mom is just crafty and clever like you. 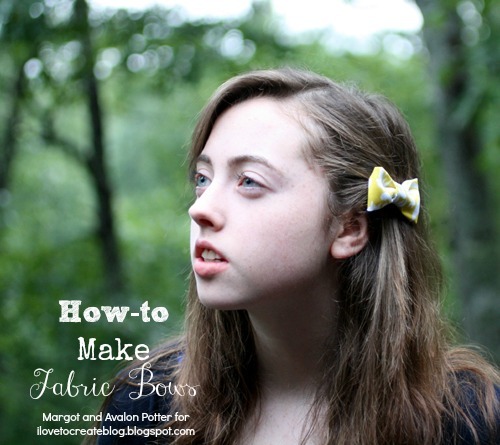 It's amazingly easy to make bows and so much fun! I bet that was adorable, and yes, probably a crafty mom. what I would do with my bows? WHAT WOULDN'T I ? 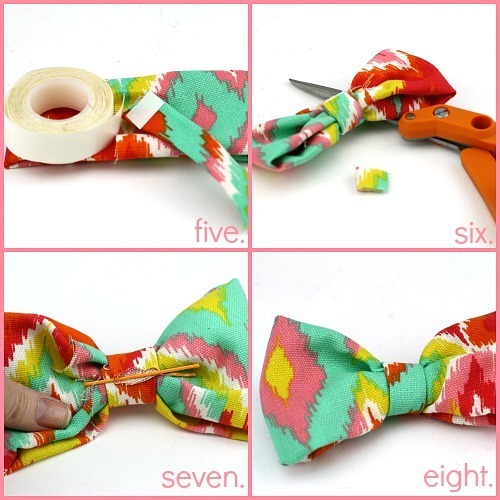 I want to grab some fabric and make bow bracelets, for one. And bow ankle braclets, to wear with bare feet until summer is over. My husband wants small bows to attach to the end of our Christmas tree branches, to match the bow tree topper we have. I hope it will work.